Almost 400,000 people have lost their Jobseeker's allowance since sanctions for claimants were toughened last year. But are the new rules hurting those they are supposed to be helping? Peter Jones avoided a serious brain injury when he fell at work in November last year. But while he escaped with his health, his good fortune ended there - he was told not to come back and went to sign on. It was a month after new rules for those out of work were introduced - rules he would soon find out all about. "I'd worked all my life," he says. "But they treated me as if I was cheating the system from day one. They didn't even know me." Anyone claiming Jobseeker's allowance (JSA) can be sanctioned for things such as missing a meeting with an adviser, not turning up to training or not being available for work. "If they do everything that's expected of them, they won't get sanctioned," a spokesman at the Department for Work and Pensions (DWP) says. Peter, who says he was applying for "five to six jobs a day", felt this was just what he was doing. He had moved from Llandudno to be near his seriously ill mother in Stafford who was in and out of hospital with brain tumours. But when he wanted to move back to Wales and look for work there, he says job centre officials 100 miles away in Stafford deemed this an "inappropriate search". He was sanctioned and did not have any income for the whole of December. He got into debt and, aged 30, moved back in with his parents. "I didn't know what to do or how to get out of it," he says. When he did manage to move, and signed on in Wales, he was sanctioned again for not attending a meeting with an adviser back in Stafford. The new regulations - which mean a minimum four-weeks without JSA for anyone deemed to have breached them - are designed to help those without a job, according to the DWP. "This is absolutely not about saving money or punishing people," the spokesman says. "Our role is to help people into work." Peter did find work as soon as he returned to Wales but, because of the sanctions, he had only received two JSA payments in the three months he was without a job. "I'm scared of ever being in that situation again," he says. And, according to the Citizens Advice Bureau (CAB), he is not alone. It says advice centres have seen a 64% increase in the number of people coming to them after being sanctioned. Invariably, the CAB says, they are desperate to get back into work. So is the new system doing what it is supposed to - helping those who want to work to do so? Not according to the CAB's chief executive Gillian Guy. "When you're already struggling to make ends meet whilst looking for work, a sanction can end up making it harder to put food on the table and adds an extra obstacle to the huge challenge of getting a job." She adds: "The regime is not only self-defeating, it is also poorly administered." For Lee Offield, 29, a 10-week sanction meant he had to turn to food banks. He had wanted to use his illustration degree to work in art therapy. After a year out of work he started a basic social care course in Bristol but had to leave half way through after his JSA was withdrawn. He was told he could not be spending enough time looking for work if he was doing a college course. Having now moved back to his home town in Devon he says the experience left with him with temporary, insecure and seasonal work instead of the social care job he had hoped for. He appealed against his sanction, won and was repaid most of the money he had been docked. While he admits he is still in debt, the money is not his overriding concern. "I could've had a career if I'd been able to continue the course," he says. "But now I don't." The union representing the frontline staff who make these sometimes life-changing decisions alleges that, since the toughening of the rules, there is an expectation they should come down hard on claimants. "There's no question that there is an overarching pressure to enforce the sanctions regime as strictly as possible," says the PCS's Charles Law. It's an accusation the DWP flatly denies. But the union says ministers' desire to get tough has led to job centre managers pushing advisers to issue sanctions. The PCS claims there are "sanctions league tables" and that staff face the first step of a disciplinary procedure if they fail to withdraw JSA from enough claimants. The DWP insists there are no such targets and that staff want people to do all they can to find work. While at the latest count more than 40% of those who received a sanction were under 24, opposition to them among young people is not universal. "I think they can be positive," 20-year-old Joe told YMCA researchers looking into attitudes to welfare. "As long as they are still able to feed themselves." The YMCA, though, says it has "serious concerns" about how the system is being administered and its impact on the young. Jamie Allen, 23, was made redundant over the summer, losing his job installing computer systems for an IT firm. His parents - one disabled and the other her full-time carer - took out a high-interest payday loan to support him after he was sanctioned for missing a session at the job centre. He says he received a text telling him his adviser was ill and not to come in until his next scheduled session - which he did the following week. A month later, a letter informed him he would not receive any JSA for four weeks because he had missed a session on the afternoon his adviser had been ill.
His mother Alyson says the text could have been misinterpreted, but that he was doing everything possible to find work - travelling for an hour to and from the nearest job centre, sometimes for two meetings a day, and applying for 128 jobs. But their appeals were met with curt responses. "We were treated as if we were nothing," Alyson says. "I know getting the loan was silly but he had no money for bus fares so couldn't get to the job centre." On average, the number of unemployed people per job vacancy has fallen from 5.6 to 4.7 in the last two years, according to the Office for National Statistics. 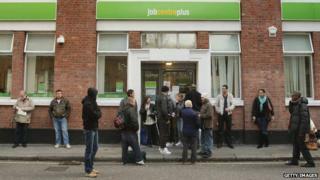 And with the economy showing signs of recovery, the government says people should do all they can to find work. "The people who get sanctions are wilfully rejecting support for no good reason," says Esther McVey the employment minister. Nicola Clubb, who has been signing on for a year after losing her job as a college tutor, fell foul of the new rules when she failed to get an application in for a Jobcentre position before it closed. She knows she was at fault: "I screwed up and didn't apply quickly enough." A DWP spokesman said the department could not comment on individual cases but added in a statement: "The rules regarding someone's entitlement to Jobseeker's allowance - and what could happen to their benefits if they don't stick to those rules - are made very clear at the start of their claim. "We will provide jobseekers with the help and support they need to find a job, but it is only fair that in return they live up to their part of the contract. "Sanctions are used as a last resort and anyone who disagrees with a decision can appeal."